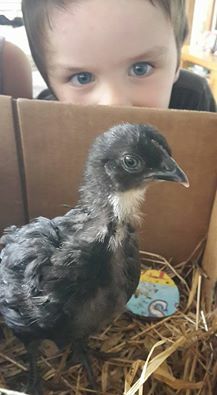 One of the best things we have done in the last year is get chooks (chickens lol), one of the worst things we have done is get ducks, but that’s for another post! Oh the fun and games we have had with these egg popping birds. We brought a box home with six four week old chicks, my boys were pumped. Not five mins after the box of chicks arrived did a goanna show up, seriously! And it walked around and around the cage, scratching at the wire, its long tongue poking in and out like a dragon. So the little things lived in the cage for many weeks and the goanna rarely came to visit them again. 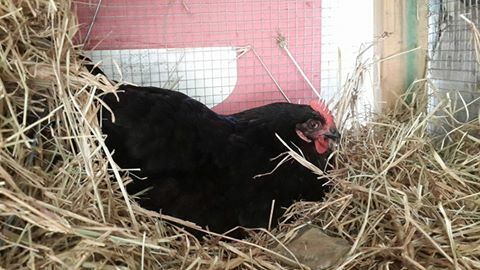 My husband Adrian asked “So when do they start laying eggs?”…. ummm like in 4-5months, He wasn’t impressed haha. But we had the fun of watching them grow from skinny, scrawny looking things that peeped and huddled in a corner to giant fluffy, noisy, confident and beautiful birds. When they got a bit bigger we decided to put a fence around the cage and let them in it through the day, very quickly they learnt how to fly up and sit on the top of the fence, you’d have the whole lot in a line together perched on the thin wire. Sometimes they got out so we clipped there wings and that ended that game. They were still far to little to be wandering around by themselves. Finally we got rid of the fence and let them roam the hill to there hearts content. They conquered new territory every week. First they went no further than the vegie gardens, than it was over at my grandparents, who weren’t so impressed with chook poo all under there house. A few weeks later they roamed down the hill into bushes and grass, they even explored in the shed. Soon they had conquered and explored the whole block, coming back through the day to eat at times. The goanna didn’t seem to bother them now they were bigger and I have a theory that because they are black chooks and now at the same size as the black bush turkeys maybe the goanna thinks they are the same, and goannas usually stay clear of adult turkeys here as the turkeys get very defensive and chase them off from there nesting areas. So I feel like I’ve won in picking black chooks 🙂 But then one night we were awoken by a muffed skwark of a chook, quickly Adrian was up and outside with the torch… all I heard was “What the F***!” as he shone the torch into the cage… no not a goanna, just a giant 3 metre python wrapped around a chook with all the other chooks huddled together. I thank God always for giving me an exceptionally brave and fearless husband, he just reaches in there within a second with his bare hands and grabs the snake wrapped around the chook and puts it in a box….. If that was me, the snake would of had the chook, there is NO WAY I would of been able to save it. But the chook was saved and the snake was relocated, all at 3am in the morning. Farm life. A new snake proof cage/pen was made the very next day. Then the noises started… you know? If only I could type the noises out but I think it would not be interpreted well. They sound like clucky chooks, chooks who want to lay an egg! So we watched and waited, and sometimes a chook would linger around the pen looking suss, but then nothing. Until an EGG! I found it, one perfect little egg in a nest lovingly made by the chook out of the hay in the pen. So it began, the egg quantity increased every week or two until we were getting 4 sometimes 5. Soon we began to wonder where the 5th chook laid sometimes and where the 6th chook was laying, if at all. Well we found it, a whole 13 egg nest amongst the bamboo leaves down behind the shed where my sister and husband were living at the time. We went through periods of 6 eggs a day in the pen, but more often or not we got an average of 4 a day and the others were laid somewhere in the vast rainforest vegetation never to be found. I became a chook stalker regularly, Id follow them at a distance to see where they would go, or whenever I heard them make “that noise” they make after laying, Id run as fast as I could down two flights of stairs, down the steep driveway, across the grass, into the bushes… to find nothing, all in my pyjamas at 7:30 in the morning. Things got really bad though when the chooks got cranky because we left them for two and half weeks under the care of my sister. Not that she did a bad job of of it, they just didn’t like us not being around (or so I tell myself). They stopped laying in the pen all together, no eggs, none. My sister couldn’t find any anywhere. So when we came back we left those naughty chooks in their pen all day instead of free ranging, so we could see if they would lay. They were not happy. But we got some eggs eventually, on some days I marked the chooks who were sitting so that when they had laid the egg I could let them out, as they are all black marking was essential. Adrian used pink spray on their tails once, so some of them ran around for days with pink on them. The marking didn’t work though as the next day different chicken would lay and it all got confusing, we hadn’t thought it through very well. So we let them out and again we got at the most 3 eggs! ARGH!!! And so it brings us to today, and all our chooks, rooster (story on him later), and ducks are fenced in. And surprise surprise we are getting 6 eggs… well we were till yesterday when a dog from the neighbourhood killed one 😦 very sad. So I guess now we get 5 eggs. And they are getting used to there new space, they still have grass and trees and Adrian made them a playground (yep), so life’s not that bad really for them. But the golden days are gone, no longer can they say they live the best chook life ever. 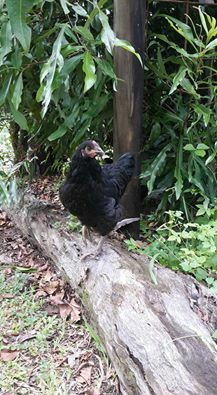 I wish they could continue life roaming free without barriers, but we would get no eggs, and they are more likely to be attacked by dogs when they venture down into the neighbourhood, led by Claude the rooster. On the upside I can now protect them better, cuddle them more, and be proud of my fluffy girls for the gift of eggs everyday! Next Post How to make holiday every week!